Most California women say they are not that concerned about recent allegations of unwanted touching by former Vice President Joe Biden as an issue in the 2020 presidential campaign, according to a new poll by Quinnipiac University. In fact, the poll of 1,005 California voters shows Biden is currently the top choice of 26 percent of Democrats and "Democratic leaners," followed by Vermont Sen. Bernie Sanders with 18 percent. California Sen. Kamala Harris came in close behind Sanders, with 17 percent. Massachusetts Sen. Elizabeth Warren and South Bend, Indiana Mayor Pete Buttigieg each have 7 percent support, while no other candidates are above 4 percent. The poll was taken before East Bay Congressman Eric Swalwell announced this week he was also running for president. Despite Biden's awkward and much-criticized video and in-person responses to charges by women who said Biden's physical closeness was unwelcome and uncomfortable, 66 percent of all voters — including 71 percent of all Democrats and 67 percent of women — say the issue is "not serious" to them. "This is tough," said lobbyist Adama Iwu, co-founder of "We Said Enough," which blew the whistle on the culture of sexual harassment in and around the state Capitol. "It's not like no one thinks this is an issue," she added, "but there's also a spectrum of things ... and he falls on the 'uncomfortable interactions' side of it." "It's not like people are saying 'we like Biden no matter what,'" Iwu also notes. "What they're saying is he can beat Trump." In fact, when asked who had the best chance of beating President Donald Trump in 2020, Biden was the clear favorite with 35 percent of Democrats and "leaners" choosing him — about twice the number who said Sanders (17 percent) and far more than Harris (9 percent). 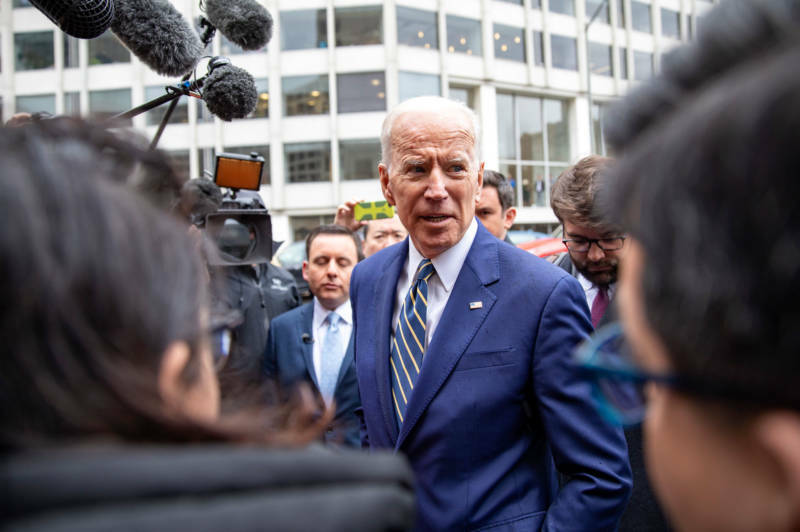 In the Quinnipiac Poll, voters also credited Biden more than the other candidates with leadership qualities, with 31 percent saying he'd be the best leader, followed by Sanders with 18 percent and 13 percent for Harris. Not surprisingly for a state that gave Hillary Clinton 4 million more votes than Donald Trump in 2016, the poll found 59 percent of voters would "definitely not vote" for Trump in 2020, even as 71 percent of Republicans said they "definitely would" vote to re-elect him. For Kamala Harris, the poll has mixed news. It indicates she has definitely surpassed other relatively high-profile candidates like Beto O'Rouke and Elizabeth Warren in California, but it shows she still has a way to go to convince voters that she has leadership qualities and can beat Trump in 2020. Some political analysts have said that moving up California's 2020 primary to March 3 from June would boost Harris's run for the nomination. But given the proportional distribution of delegates Democrats use, there won't be any "winner take all" benefit to "favorite daughter" Harris, or anyone else.